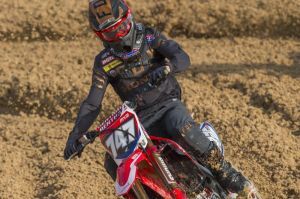 Under the glowing spotlights of Losail Circuit, Michele Cervellin and Chihiro Notsuka lined up with their Honda CRF250RW’s for the first qualifying race of the season in Qatar. Both riders showed promise early on with good laps in timed practice. With the track getting rougher throughout the day, it was always going to be an eye opener for both the young Italian and Japanese having never ridden outside of their home countries/Europe. Cervellin didn’t have such a strong start out the gate and after narrowly avoiding a collison in the first corner found himself in the top 15. Mid race he appeared to be in a ‘no man’s land’ but digging deep for the second half of the race, Cervellin found himself finishing just outside of the top 10. Notsuka had a good start to his first ever qualifying race in the highly competitive MX2 class. Off the start he swung wide outside of the pack and quickly got into the top 15 where he flourished for the first half of the race. Losing the front six mins before the end cost Notsuka’s overall result.